This lease is for letting part of a multi-tenanted building for offices or business purposes. The building could be a modern office block or offices above retail space. Features: guarantor provision; break provision; rent review options; draft agreement for a security deposit; options for assignment; no sub-letting. This lease has been drawn for letting a suite of rooms, or a whole floor, of a multi-tenanted building for business use. The building could be a modern office “block” or a refurbished older building. Although drawn by reference to office use, the lease can be adapted very easily to any multi let commercial building. If you are letting an entire office building to a single tenant, look at Self contained office lease agreement. 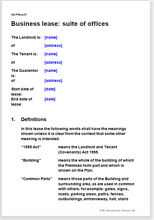 If your building is one of several you own on the same estate, look at this lease template. This includes service charge recovery provisions. Commercial leases in New Zealand are governed by the Property Law Act 2007. There is no legal requirement that lease must be registered. However, the parties have the option of protecting their interests by registering the lease. This office lease is comprehensive, providing alternative choices for important decisions.